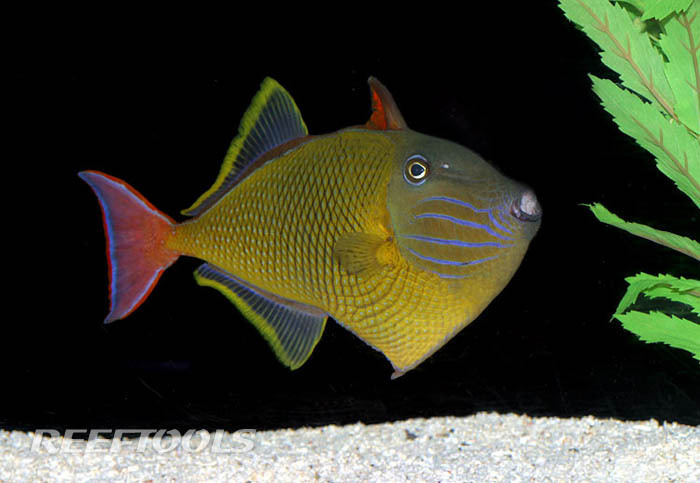 The Crosshatch Triggerfish, Xanthichthys mento, is a strickingly colorful fish. Also known as the Blue Cheekline Triggerfish, it has a yellow body with dark lines which create a crosshatch pattern. The Crosshatch Triggerfish has beautiful blue lines on it’s face. They begin at the mouth, and continue until the back of this Triggerfish’s gill plate. 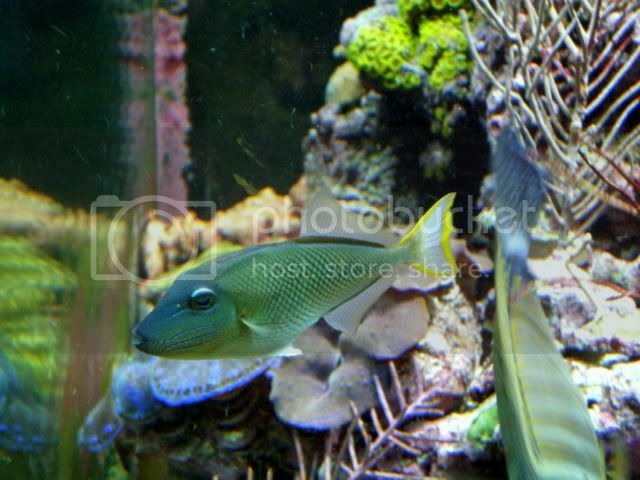 Blue colored fins, oulined in bright yellow, and a red tail, complete the the color pallete for this aggresive fish. 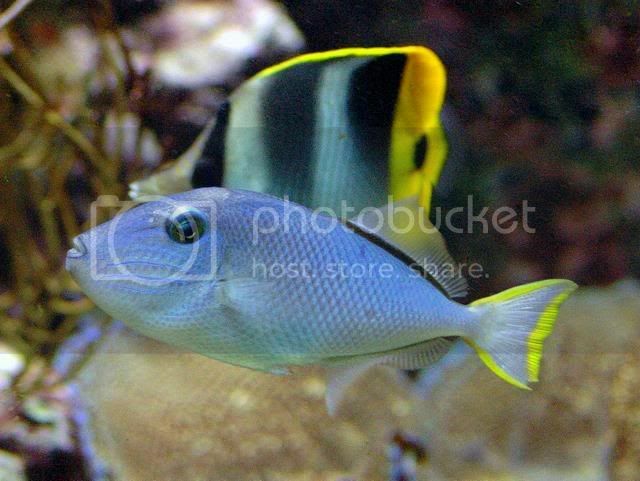 The Crosshatch Triggerfish is not reef safe, and required a tank of at least 75 gallons with many rocks and hiding places. Take great care in arranging your aquascaping as this fish may decide one day that it is not to it’s likeing, and start moving things around. Reef-safe epoxy, glue, or plastic rods will assist you in securing your reef tank’s rockscape. 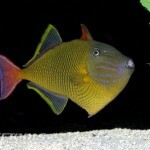 This Triggerfish has a great personality and with it’s bright colors, will make for a great centerpiece in any tank. The Crosshatch Triggerfish required meaty food in it’s diet. Marine flesh, clams, krill, silvreside, misys are a few favored examples, while hard-shelled shrimp can be used to help file down this Triggerfish’s teeth, as they continue to grow. For the hobby aquarist, all triggers need to be considered “expert” – and as mentioned, they like to “re-arrange” their homes… they have all day to re-arrange and they get “their way” in the end! I actually thought the general consensus with these was that like most Xanthichthys species, these are open-water planktivores (see upturned mouth) and thus about as reef-safe as any trigger gets. Thus I’m sort of surprised to see the comment “is not reef safe” without any qualifiers or examples as to specifically why the writer makes this declaration. My own experience with this species is very small, at two months with a small juvenile, but I have certainly not witnessed any behaviour to the contrary regarding feeding behaviours of open-water plankton chasing. My guess would be that “perhaps” small ornamental shrimp might be at risk. However I can at least offer the observation that small hermit crabs and other rock crabs have not been shown any interest so far. Also no indication for rearranging rockwork, which I thought was more of a Picasso trigger/Humu trigger behaviour anyhow. Tony, great info. The coral safe and invertebrate safe are the qualifications for the reef safe statement. 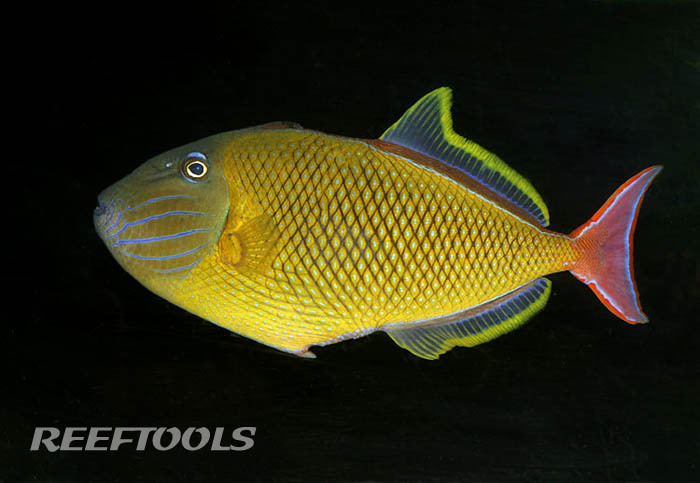 We included that the Crosshatch Triggerfish “may eat shrimp”, as well as should be “monitored” with corals (it may decide that your corals are misplaced, like your rockwork). Naturally, these are generalizations, and individual experiences with specific individuals may vary. Any pictures of yours? Sorry, my bad – I did not see the quick info box to the side the first time I read the page. So, my guess about the shrimp is probably not far off then. I made that guess after watching mine eat krill with particular vigor. As a juvenile (current size approx 3″ in length), mine displays neither male nor female colour attributes. The colour is an overall green, but the crosshatch patterning is visible as well as the blue lines on the cheeks. One interesting observation is that this fish will change colours depending on mood – when in eager anticipation for feeding, for example, the fish turns blue. At first I thought this was more a function of the viewing angle but I notice it everytime I feed. He (or she?) can in fact get a deeper colour of blue, but I haven’t yet managed to get a picture of that yet. Will keep trying! I had an 8″ male in the shop’s show tank for 6 months without any issue with the Lysmata spp., nor the small fish, nor the corals. He was evicted because he wasn’t reefer safe (we called him Bitey) but this, I hear, is not the norm. I’ve asked other shop owners about their crosshatches as I’ve traveled shop to shop seeing these guys in other displays. So far no complaints but you never know what happens long term with any nippy fish like these.